If your mornings are like a crazed comedy routine (minus the laughs)—with packing lunches, getting everyone dressed, grabbing permission slips and preparing breakfast, you know all too well the drill of playing mom or dad and the pile of never-ending tasks that it entails. Playing the role of momager, chauffeur, homework helper, cook and maid, is often too much to juggle. If you need relief from one of your roles, we’re here to help. All Star Cleaning Services in Northern Colorado offers a solution to helping families put more time back into their days. While a home needs to be cleaned regularly, when you have all the roles mentioned above, it’s nearly impossible to find the time to do so. 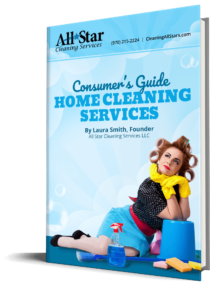 Trying to find the time to clean your home on top of all your other endless tasks can be stressful. Yet neglecting to do so can result in even more anxiety and frazzled nerves. So, what can you do? Hire All Star Cleaning to improve the quality of your life by tending to the needs of your home and taking a huge task off your very full plate. All Star Cleaning is a maid service with an eco-minded mission. We offer green cleaning services to benefit the health and harmony of your home and serve the greater good. Colorado is the perfect place for hiking, biking and enjoying the outdoors. But you know this, that’s why you live here, right? When you’re spending time wiping the pantry and vacuuming the floors, you’re not outside enjoying all that Colorado has to offer. Hire All Star Cleaning Service and give yourself more time for recreation and play in our Colorado paradise. Remember that? You time? Maybe not. But trust me, you deserve it and All Star Cleaning can help. With add-on services like washing dishes, doing laundry and sheet changes as well as handyman services available through our new sister company Handyman Connection, our maid service professionals will make your days feel freer and give you time for errands, self-improvement or hobbies. Remember those? More time away from the duster and the mop means more time for family baseball games, movies and visits to amusement parks. We’ll get your kitchen sparkling so that dinner time is easier, faster and more enjoyable with your family. We’ll make bedtime easier when sheets are fresh and bedtime stories and bears are in their right place. Our cleaning team will allow you to enjoy time with your family sans guilt. No more worrying about the messy bathrooms, kitchen stoves or floors! Get Your Clean Dream Home Today! Call Our Professionals in Northern Colorado at 970-215-2224 (Fort Collins) or Visit Us online and We’ll Send You a Quote.